The evening of day two of my visit to Sharjah (UAE) I sent emails to several Emirati poets who were attending the book fair, and asked if they’d grant me interviews. I came to the country with an idea to write about poetry from this region, but “this region” is a big vague chunk. Narrowing the goal down to Emirati (go here to learn what being an Emirati means) poets made the most sense since their poetry culture seemed so rich here (one of the most popular TV shows in the country is a poetry contest show called Millions Poet). Within two hours after sending the emails, three of the poets had replied, and the fourth replied by morning. The next day, after breakfast in the hotel (they serve beef bacon, which looks like pastrami, instead of pork bacon, and tastes nothing like bacon) I asked my driver (each of the guest writers was assigned a driver) to take me back to the book fair so I could track down those poets. I felt like a bit of a stalker, walking around the convention center to blindly interrogate writers, but this is one of the main reasons I was here. First I met with Ali Al Shaali. Al Shaali studied engineering and is also a publisher himself, mostly of books for young adults. 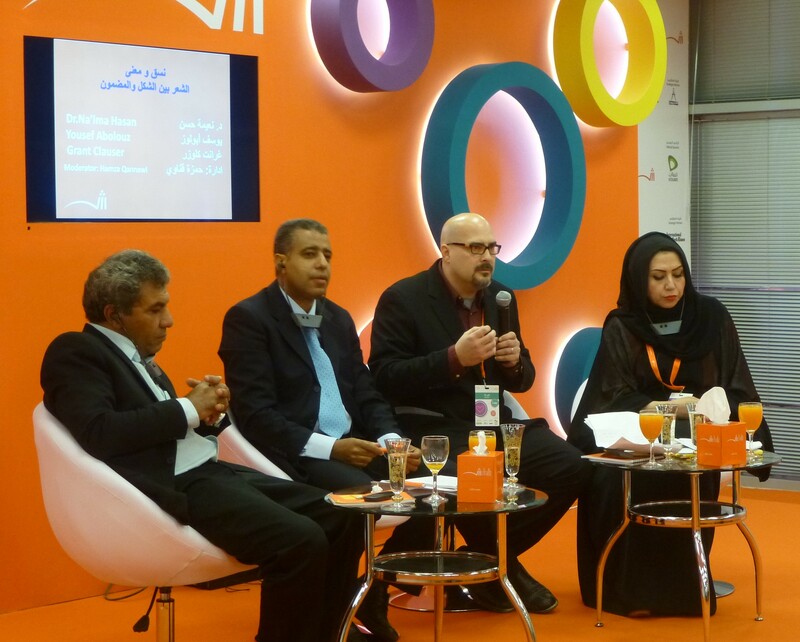 We spoke about poetry’s place in the Arabic world in general, and in the Emirates specifically. While explaining that poetry is very deeply rooted in the culture “we decorate our homes with it,” he said, he also noted that novels, TV and other media have replaced poetry for a lot of people. 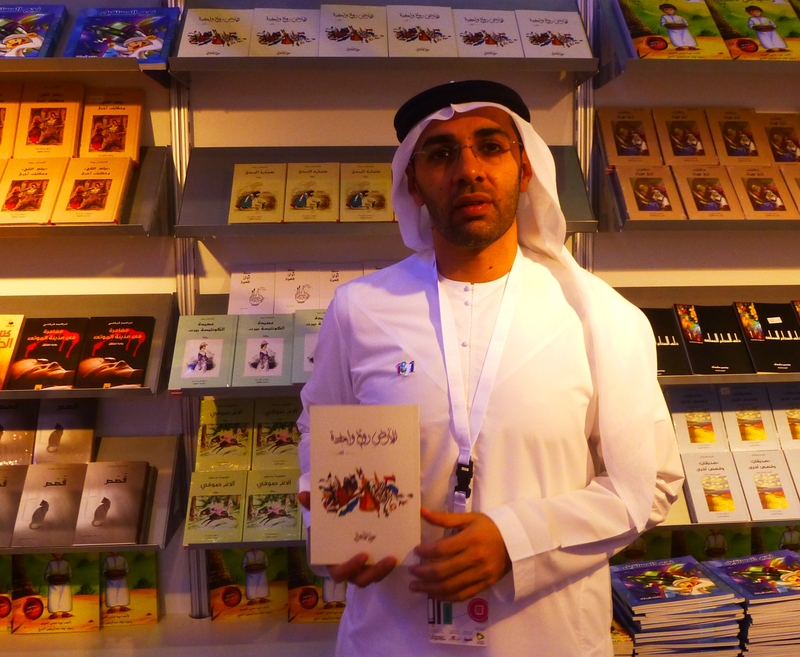 “This has been the case for poetry since the dawn of history, and I’m not worried about it.” However, he pointed out that poetry has a particularly strong supporter in the country—the ruler of Dubai and vice president of the UAE is a poet and has published books (I bought one while at the fair). Next I was lucky enough to meet with Shihab Ghanem, who happens to also be an engineer with degrees from the UK. 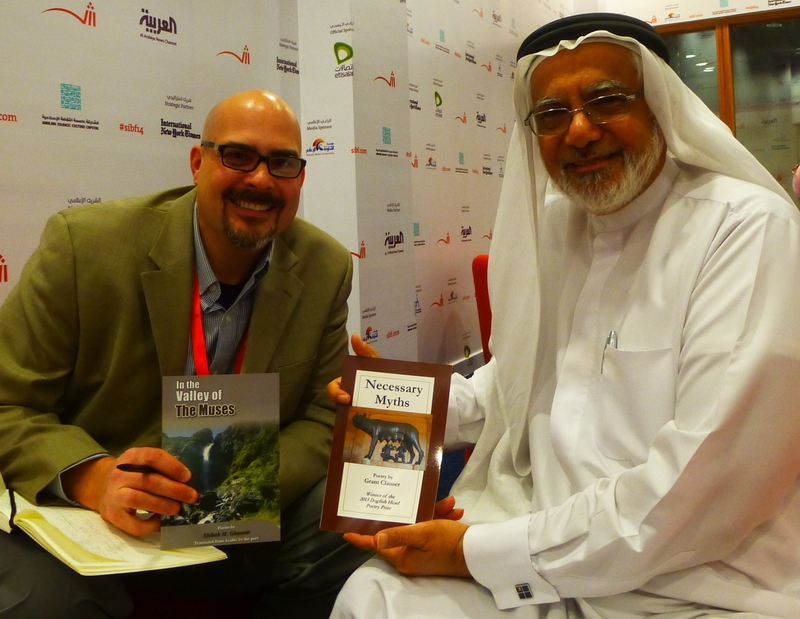 Ghanem is a well-known poet in the UAE, and knows most of the other significant poets. In addition to his own poems, he’s translated several English language poets (Frost and Auden are two he mentioned to me) into Arabic. He’s also a key person in an annual poetry festival held in Dubai called The Poetic Heart. My third poet/engineer of the day was Talal Salim. That pattern is actually pretty common. In the UAE, and in the rest of the Arab world, the path to being a writer doesn’t involve creative writing classes and MFAs. That’s mostly an American phenomenon. People come to poetry writing more organically here. Sometimes through university study of Arabic literature, but mostly by just its infusion in life. 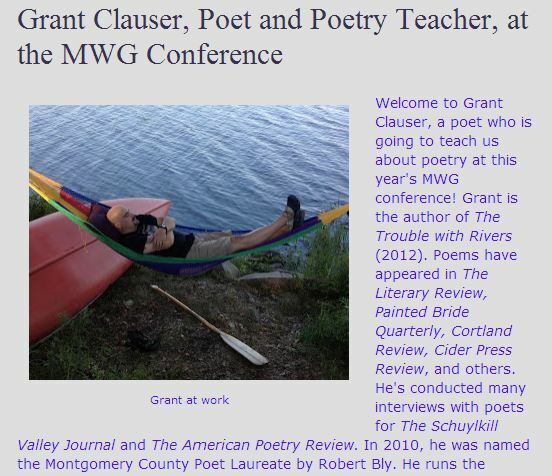 All of the writers I spoke to that week became hooked on poetry as school children, and continued to immerse themselves in it alongside their other careers and studies. Why don’t we have more poet-engineers in the US? The next day I had two women Emirati poets on my list. Back to the book fair I went. The first was Sheikha Al-Mutairi (photo on the right). Unlike the previous day’s interviewees, Al-Mutairi specialized in Arabic literature in college. Next was a meeting with Salha Ghabish, who in addition to being a poet, has been a magazine editor, has published plays, a novel and done radio and TV. 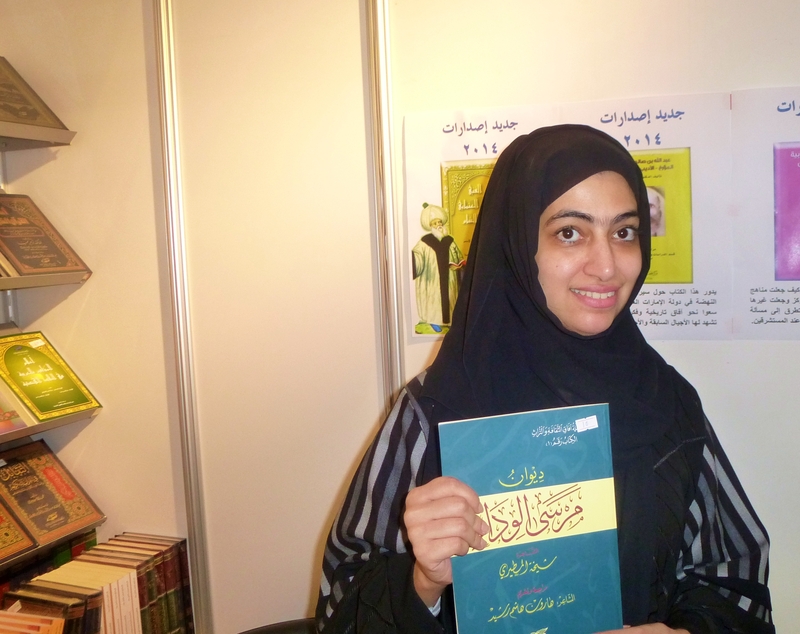 Ghabish’s English was a little rusty, so Noura Al Noman, an Arabic sci-fi novelist, helped with translation. These interviews, in case you’re wondering, are all for an article that will be published later in a US poetry magazine. I’m not including details from the interviews here, because I want to save them for the article. 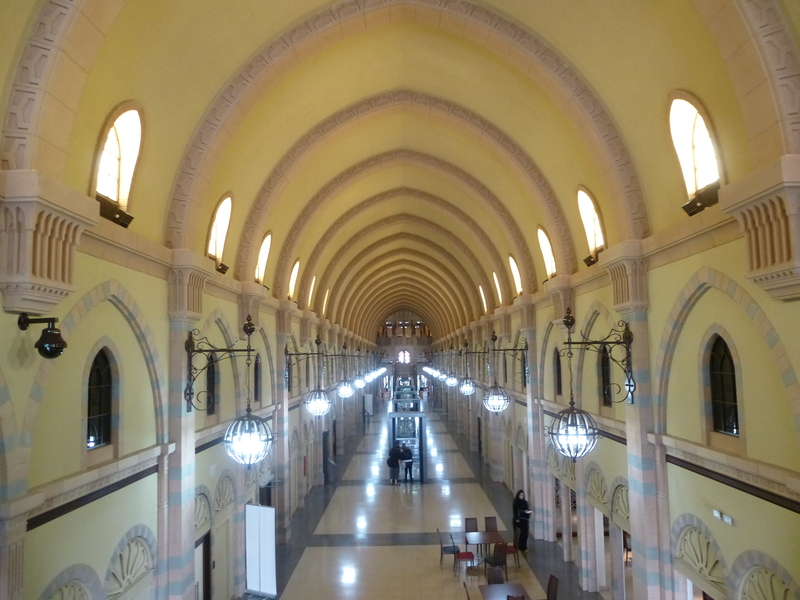 The next day, Thursday, was my last full day in Sharjah, and a free day. I spent the afternoon visiting museums, walking around the city and being a tourist. In the evening, Hamza Qenawy, a journalist for the arts and culture magazine Dubai Al Thakafiya, met me in the hotel lobby for an interview about my own poetry. Unfortunately for me, the magazine is published only in Arabic, so I won’t be able to read the piece when it comes out. In addition to the local writers already mentioned, the book fair introduced me to other guest writers from around the world. Altogether, it was a pretty amazing week. I’m very grateful to the Sharjah Book Fair for inviting and hosting me for this event, and for the time and attention the writers I met there granted me. My second day in Sharjah included only a little book fair activity. After breakfast I headed over to the expo center to wander around and hopefully connect with some local poets for an article I’m planning. It turned out that Sunday morning (weekends in UAE are Friday and Saturday) was for school children. The parking lot was crowded with school buses, and the fair halls were thronged with kids. Most of the kids were in uniforms or traditional Arab clothing (I haven’t yet sorted out which outfits mean what—but that’s on my list of things to learn). While at home it’s rare to see many children at a book store (maybe because we shop at Amazon), here thousands of kids tore through the book fair like hurricanes, paging through books, scattering them over tables, waving them at booksellers asking for prices, and spilling a little ice cream or drinks on the floor. I was chatting with an Indian bookseller in his booth when a group of kids charged in. “I have no books for children,” he said as he shuffled them off and back down the hall. Like kids everywhere, they seemed to congregate around comic books, animal books, and anything related to super heroes or Disney characters. Many sellers offered illustrated books about Islam, and there were usually groups of kids paging through those. 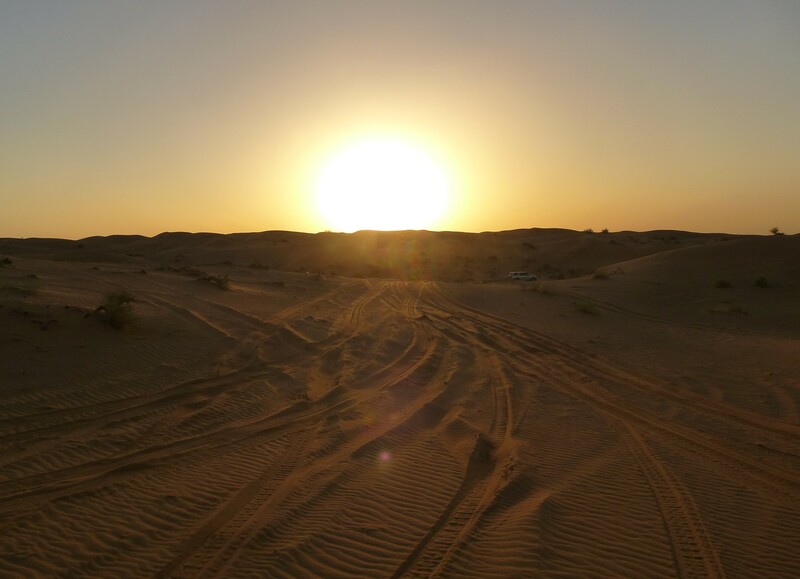 After leaving the book fair I joined a group of other invited writers (from Pakistan, Germany, India, China, Australia and more) for a desert adventure. We drove about an hour outside of the city where the landscape turned into waving dunes, date trees and small desert bushes. When we arrived at our destination, the drivers let about half the air out of the tires of the 4x4s and took us for a roller coaster drive over the dunes. One of the land rovers got temporarily stuck atop a dune precipice and needed to be pulled off by one of the other trucks. 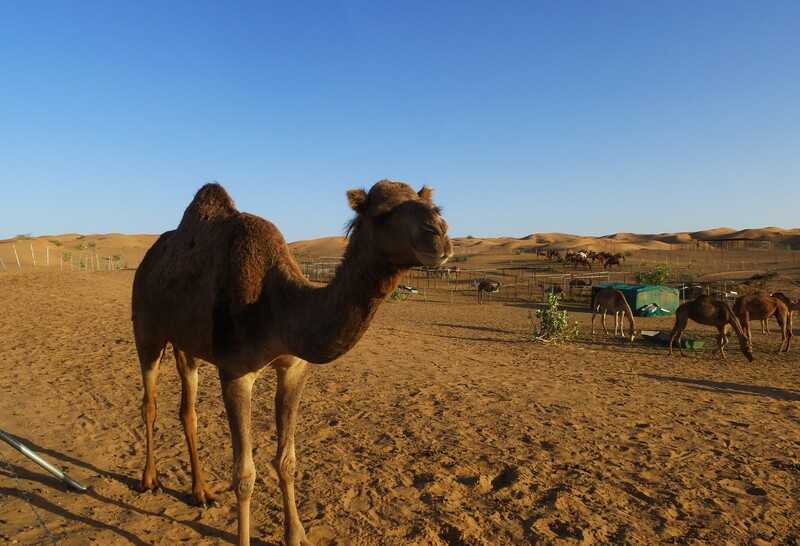 After dune bashing for a while, all the Land Rovers parked, and our attendants rolled carpets over the sand and set up a tent to serve coffee while we were given a demonstration of Bedouin falconry. It wasn’t too much longer before the sun dropped below the dunes. A good dinner of shish kebobs and some camel rides later, and we piled into the vehicles for the ride back to the city. 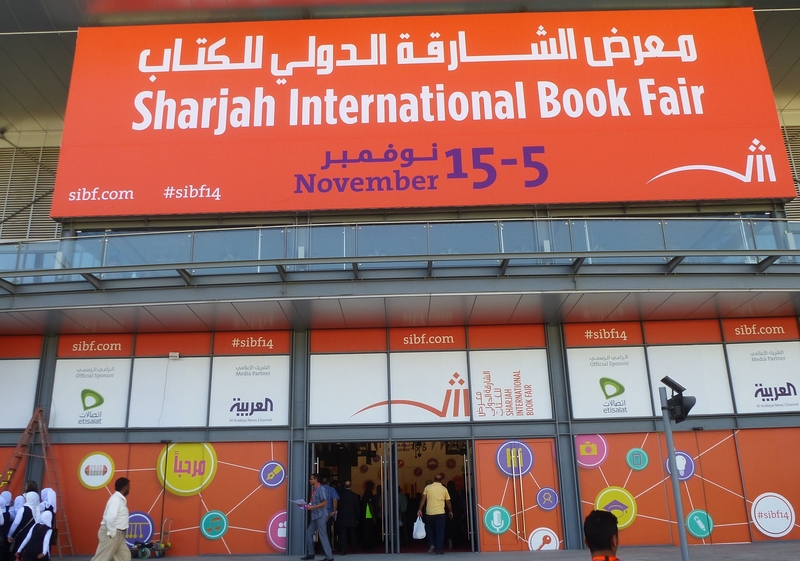 This week I’m particularly thrilled to be a guest author of the Sharjah International Book Fair in the United Arab Emirates. 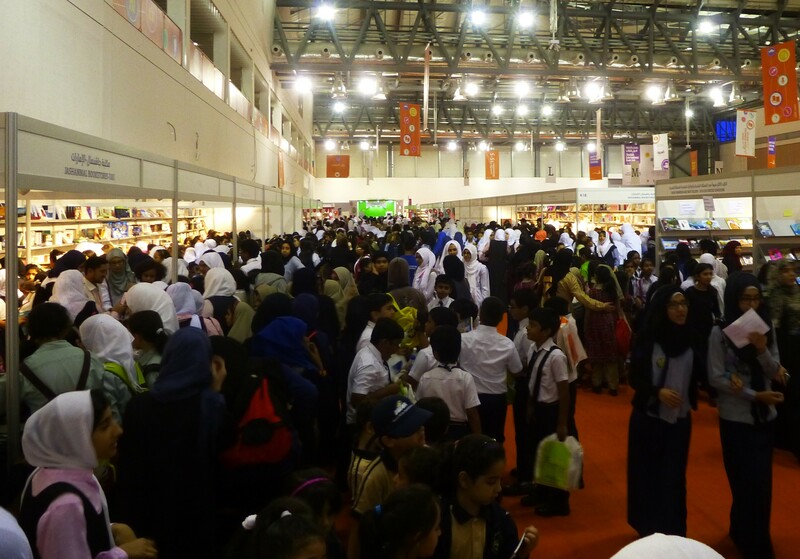 Book fairs are a big attraction in the UAE, and the annual event in Sharjah is the biggest of them. Throughout the week I’ll post updates on my experiences here. Day one started with my arrival at the Dubai airport early in the morning after 13 or so hours of flying (with very little sleep, though I did watch about 8 hours of season 2 of Vikings). When I finally arrived at the hotel (and found a welcome package with dates and flowers waiting for me) I went right to bed. My first and only Book Fair event of the day was an evening panel discussion on the relationship of form and content in poetry. I shared the panel with Gaza-born poet Na’ima Hasan and Yousef Abolouz, winner of the Arab Literary Award from the Jordan Writers’ Union. The session was moderated by poet Hamza Qannawi. I’m afraid to admit, that even with a translator speaking the English words into my wireless earphones, I had difficulty following the other presentations. A big problem is that literary translation can’t be done on the fly, so at one point the translator simply stopped trying. In my own presentation, I discussed the approach to form in two different ways. The first was about form in the classical sense of the word (meter, lineation, stanza structure) and how making those structural choice early in the poem is an important aid to the poet during composition because it takes some of the decision-making element out of the process and can influence, or even force, language choice. The other kind of form I referred to is more of what I call the purpose-built poem—from as function. Poems that are purpose built to perform a specific function (odes, elegies, letter poems, praise poems…) also aid the writer by restricting choices. Those kinds of forms have built-in goals (though they can be vague goals), audiences, and voices, which all contribute to the content/meaning layer of the poems. Based on the questions from the audience, and the conversations I had with listeners afterword, I think the talk went over fairly well. I hope jetlag didn’t make me incoherent. After the panel I went out to dinner with my old college friends Farid and Omer and the writer Saba Imtiaz at the best Thai restaurant in the UAE. There will be more to report on tomorrow as I plan to spend more time at the book fair and hope to do some interviews with poets I meet.